Over the past 30 years, renowned Japanese animation company Studio Ghibli has produced several of the Japan’s highest grossing anime films ever but since its co-founder Hayao Miyazaki announced his retirement in late 2014, the studio’s future has been in limbo. Fortunately, fans in the US have a new reason to be excited, as one of Studio Ghibli’s seminal works is finally being made available for American audiences. First released in 1991, Only Yesterday is director Isao Takahata’s follow-up to the devastating war film Grave of the Fireflies that serves as a ebullient and life-affirming counterpoint to the overwhelming tragedy of his previous work. We begin in 1982, where 27-year-old Taeko (Daisy Ridley) finds herself yearning for a more simplified way of life after having lived in the non-stop hustle and bustle of Tokyo her entire life. She decides to take a trip to visit relatives in the rural countryside but during her overnight train ride, Taeko is overcome with vivid memories from her schoolyard days that cause her to reflect on the purity and innocence of her childhood. The film wistfully tracks between this time period in 1966, where 10-year-old Taeko (Alison Fernandez) is just starting in the fifth grade, and the “present” time in 1982 that finds her helping her relatives harvest their seemingly endless fields of safflowers. One of the artistic techniques that Takahata uses to differentiate between these two time periods is to depict the past with a sort of hazy glow around the edges of the frame but it’s not done in a way that calls too much attention to itself. Besides being a clever way to visually distinguish the story’s timeline, this also serves as a subtle commentary on how we tend to overly sentimentalize stories from our childhood when the memories become blurred and fuzzier as time goes on. The sharp, crisp animation style of urban Tokyo shows a world with clear limitations but the bright and dreamlike scenes from Taeko’s childhood suggest a largely undiscovered world with infinite possibilities. The flashbacks play like extended vignettes that aren’t meant to relay specific sets of plot-relevant details but rather convey the feeling of longing that the main character is consumed with during her later years. These stories seem to come about in an almost random order but nonetheless cover a wide range of emotional territory: some are bittersweet, some are heartbreaking and some are quite amusing as well. An awkward first exchange between Taeko and her first childhood crush, during which the two share a hilariously unproductive conversation about whether they prefer cloudy or sunny days, perhaps best captures all three of these sentiments within one scene. The coming-of-age material is very effective on its own but ultimately, this is a story of a young woman coming to terms with her past and deciding to break free from the burdens and expectations of her friends and family. 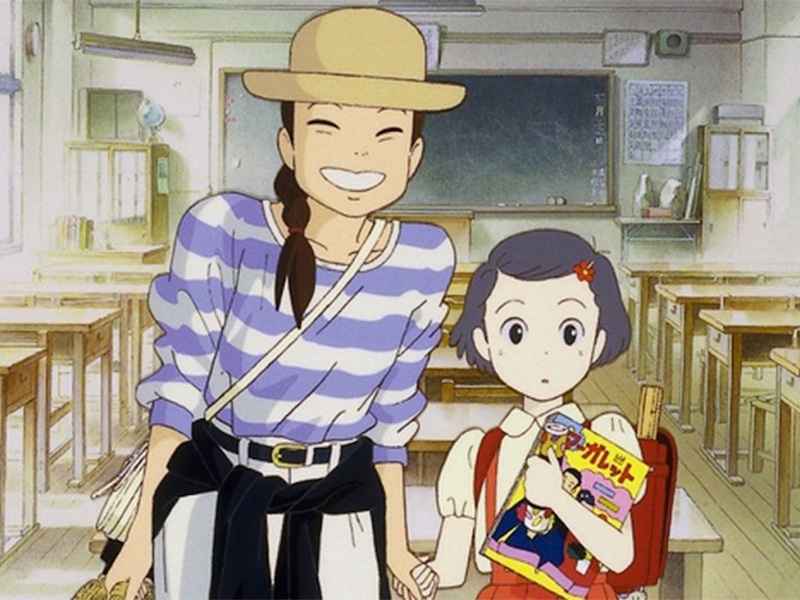 The movie’s originally title translates roughly from Japanese to “memories trickle down” but it turns out that Only Yesterday is an even more evocative and appropriate title after all. It not only captures this film’s signature brand of charming nostalgia but also serves as a potent reminder that the past can be rendered inconsequential for those willing to overcome it.